designed for you...built for your future. 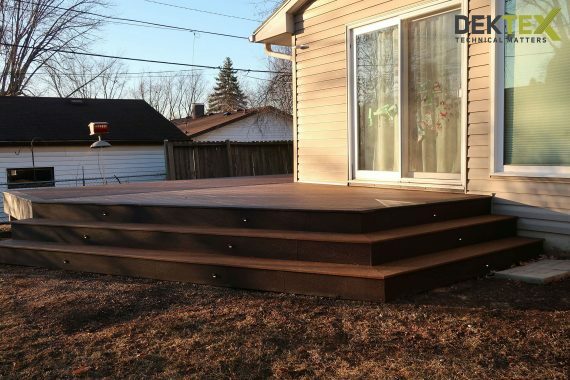 Deck additions are one of the most rewarding ways to improve your home. It’s also an excellent way to increase your home’s value as homeowners typically see large return on their construction investments. Our docks are built with only the finest materials and craftsmanship. We can build from your designs or let our technical designs surpass your expectations. Our outdoor living spaces are custom designed and manufactured to meet each customer’s unique specifications and needs. Our team of experienced craftsmen will help you choose a size, style and type of screen room that best meets the goal of your designated space. It’s true! Nothing clears the mind like stepping outside for some fresh air, conversations underneath the stars or having coffee while watching the sun come up. Decks allow us to enjoy these moments that refresh our mind and spirits. 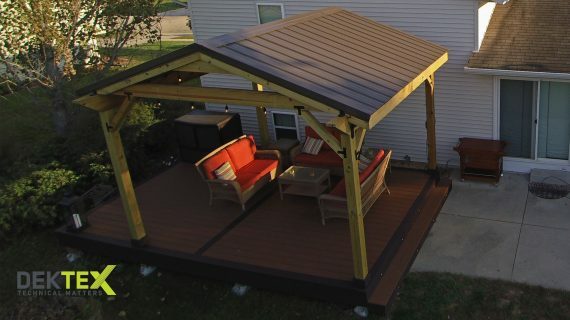 We’re proud to be creating moments like these for our customers in Madison and the surrounding areas, we want to help you build your dream outdoor living space! A lot goes into designing a custom deck. There are many things to consider such as the current landscaping and the structure that the deck is being attached to. Do we want the deck in a shady place, or in a place that receives as as much sun as possible? Is there need for custom railings, or a bump-out for a BBQ or what about a covered cooking area? If there’s one thing we’ve learned is that years of skilled craftsmanship, experience and dedication go into designing any deck. A suitable dock for your boat not only provides a safe, secure location for your vessel, it is also a great opportunity to create the ambiance you want for passengers entering or leaving. We are an experienced firm of dock contractors who are able to create the safe, durable and visually appealing docking space you want on your property. Whether you need moorings for a smaller boat, require something more appropriate for a larger vessel, or you need dock space for more than multiple water craft, Dektex can design a solution that meets your needs. Many people love the idea of relaxing by the water before or after a sail, and a well-designed deck adjacent or attached to your docking area provides the perfect location for entertaining or unwinding. A deck also adds versatility to their waterside dock, providing room for goods or equipment being loaded onto or off your boat, as well as the perfect space for a barbecue, buffet or any other al fresco dining occasion. 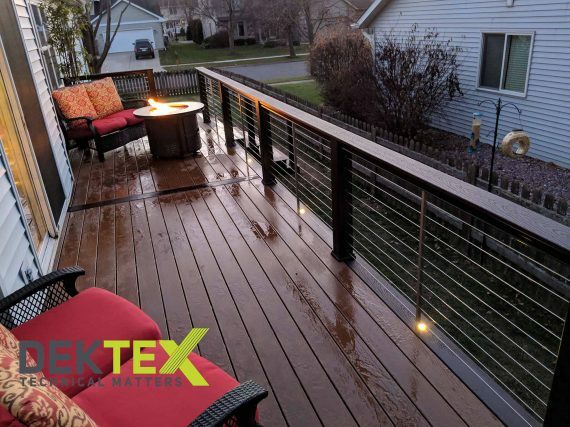 We are seasoned deck and dock contractors with years of experience designing and building high-grade decks and docking areas. Our team is very comfortable customizing to fit the needs of individual clients. We listen carefully to your requirements, needs and wants, design a structure that transforms your dreams into reality, then our skilled construction professionals bring that structure to life by using premium materials and expert workmanship. 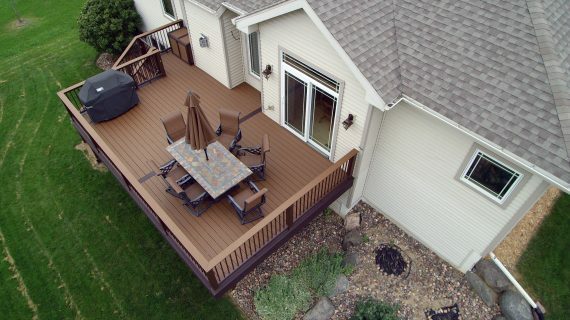 Because our company specializes in decks and docks, we have in-depth knowledge of the market. This enables us to price competitively, as well as offer an enormous selection of potential options for your decking and/or docking project. To find out more about our services, or to discuss your requirements in more detail with experienced professionals that have a wealth of creativity and inspirational ideas to offer, call us at (608) 216-2002. Each dock and boathouse is unique in its design beginnings. We will be able to quickly and efficiently design the right plan for you. The possibilities are limitless. Our unique structural designs are more than cosmetic embellishments; they are an integral part of the structural integrity of each and every dock or boathouse we build. Every lake bottom is different: some are sand, some are muck or mud, some are hard pan or even rock. We use the equipment that best suits the situation. Whether it be high pressure water jets, pneumatic pile driving or drilling through rock to get that secure footing, we can do it all. Part of the way we measure our success is how often our customers refer us to others. We endeavor to be the deck, dock and exterior living space builders that you proudly tell your friends about. Russ went above and beyond to make our deck project amazing. Out of the many projects we've had done to our homes, Russ has been the best! Phenomenal overall experience! On time, as projected and within budget! Would definitely suggest working with Russ and his crew again!